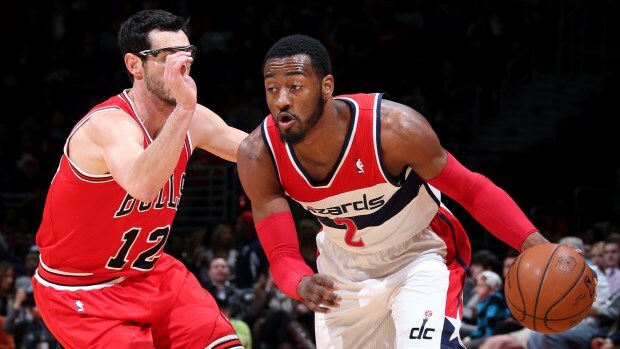 The wizards came home to DC with a 2-0 lead over the Chicago Bulls, but the wizards weren’t able to extend their lead to 3-0 as they fell to the bulls in their first playoff home game since the 2007-08 season 100-97. Mike Dunleavy led the bulls with 35 points, shooting 8-10 from the 3-point line and 12-19 from the field. All the first-round playoff matches have been closely contested with the exception of the Miami/Charlotte matchup and some of these games have been quite intense. Tempers have run high in this series and may cost Washington the chance to go up 3-1 in front of their home crowd. Nene has been suspended for game four of the series on Sunday afternoon, due to his altercation with Jimmy Butler during game three. 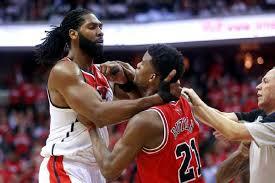 After a basket by Nene,the two got tangled up before Nene head-butted and grabbed Butler, attempting to throw him down. Nene was subsequently ejected from the game. Nene is a significant loss for the wizards, who will start Trevor Booker in his spot. This means John Wall, Bradely Beal, Trevor Ariza and the rest of the wizards will need to fill the void that;s going to be left my by Nene’s absence.